One of the best kept secrets of Namibia is its northwest area, Damaraland, it is one of the most scenic areas in Namibia. Huge, untamed, and ruggedly beautiful it is an area that offers more than the ordinary, and for the extreme traveller it can also offer a more adventurous challenge. Most visitors to the African country of Namibia find themselves attracted to the coastal town of Swakopmund, the dunes of Sossusvlei or the salt pans of Etosha National Park, but the Kunene region, which is home to Damaraland, is mostly free of people, especially tourists. When looking at populations, Namibia is believed to have the second-lowest population density of any country on earth, but when you start looking at the Damaraland area this number drops even further. Only a few thousand Himba inhabit this landscape of 100 000 square kilometres, stretching from the town of Khorixas in the south to the Angolan border. With only 150mm of rain falling annually and some years no rainfall at all, the climate plays a major role in the population figures. But hot dry weather is not a reason to visit an area, what is though is an impressive albeit intimidating landscape. 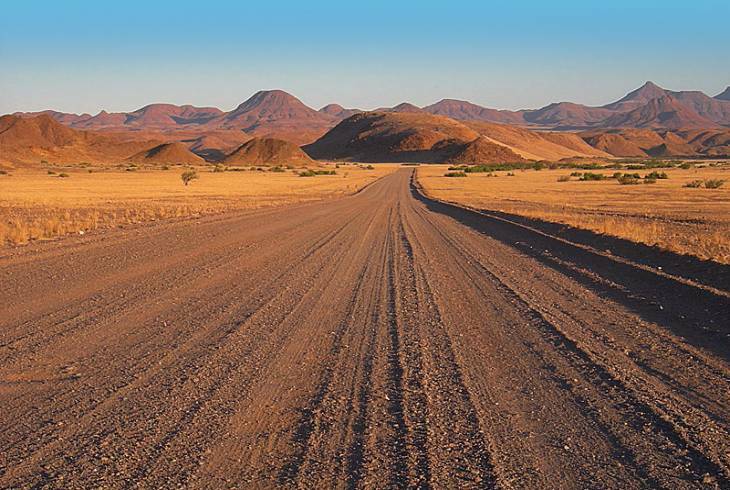 Damaraland has rugged mountains in the eastern escarpment which spread out into massive valleys and plains, before the beginning of the Skeleton Coast in the west, where endless dunes lie adjacent to the cold Atlantic Ocean. It is a place with prehistoric water courses, open plains and grasslands, massive granite koppies and deep gorges. This area is wild land, where visitors can drive for two days and not see another car, and where you feel inferior compared to the grandeur of nature. If you're searching for your soul, then come find it here. As you travel westwards through the area, landscape changes dramatically with endless sandy wastes, that despite their appearance are able to sustain small, but wide-ranging, populations of desert elephants, black rhino, giraffe, ostrich and springbok. These are animals that have adapted their lifestyles to survive the harshness of these sun-blistered, almost waterless desert spaces. The elephants in Darmaland move through euphorbia bush country, and often travel up to 70 kilometres in search of food and water and unusually, do not destroy trees in their quest for food. Damaraland was originally a name that was given to the north-central part of South West Africa which later became Namibia. The area was inhabited by the Damara people and was surrounded by Ovamboland in the north, the Namib Desert in the west, the Kalahari Desert in the east, and Windhoek in the south. The name Damaraland was revived in the 1970's by the apartheid government to be a self-governing homeland for the Damara people and a centrally administered local government was created in 1980. The area extends 200km inland from the desolate Skeleton Coast and 600km southwards from Kaokoland. With such a large area being covered it is only fitting that it have some noteworthy attractions. Some of the attractions in Darmaland include: The Brandberg which is recorded as Namibia's highest mountain and home to the famous 'White Lady Bushman Painting. The Brandberg is named after the effect created by the setting of the sun on its western face, which causes the granite massif to resemble a burning slag heap glowing red. Spitzkoppe is an isolated small mountain (or Inselberg) that rises abruptly from its level surrounding plain and is a place of great mystery to the ancient San people. Both the Brandberg and the Spitzkoppe are favourite spots for climbers in Namibia, and both mountains contain a high density of San (Bushman) art. Twyfelfontein is a wonderful rocky outcrop with thousands of Bushman engravings, a collection which is regarded as one of the most extensive in Africa. Twyfelfontein was Namibia's first World Heritage Site and was proclaimed in 2007. The site contains more than 2 500 engravings, some dating back 6 000 years, when hunter gatherer bushmen lived in the area, drinking from the nearby spring. The Petrified Forest which is millions of years old. Two other well-known geological features that are in close proximity to Twyfelfontein are the Organ Pipes and the Burnt Mountain. The Organ Pipes are a distinctive series of dolerite pillars that have been exposed by erosion and can be viewed in the small gorge on the left hand side of the road leading to the Burnt Mountain. This flat-topped mountain derives its name from the piles of blackened limestone at its base. A relatively new addition to tourism in the area is the addition of Rhino and Elephant tracking safaris. Proceeds from these safaris go towards the preservation of these animals and there are numerous guided safaris to Damaraland and these offer an informative way of visiting the area. Damaraland overview. Damaraland Accommodation and Information.